Portsmouth striker Lomana LuaLua could be sidelined for up to three weeks with a groin problem. 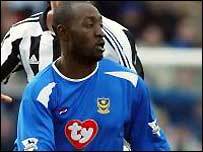 However, the ex-Newcastle man does not need surgery - and Pompey's fixtures mean he could only miss one match. Harry Redknapp's side do not have a game in midweek or this weekend, while most other sides play twice. Although LuaLua would miss the visit of Fulham next Monday, 30 August, Pompey are then not back in action until they host Crystal Palace on 11 September.